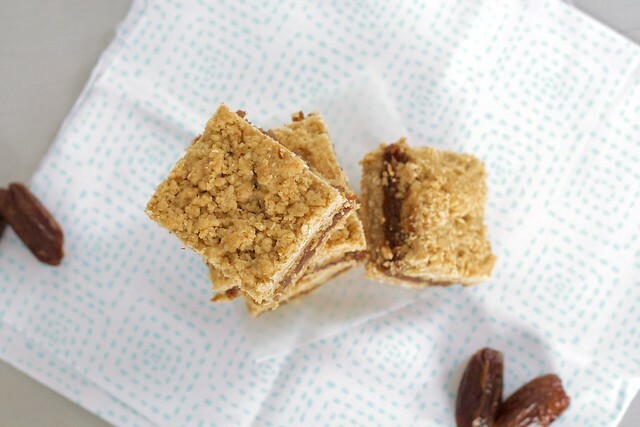 A few days ago, my husband requested I make date bars for dessert. Say what? 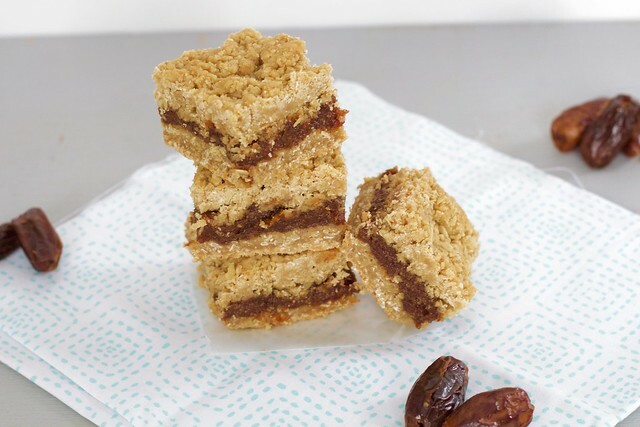 I can't say that I have ever tasted a date bar, let alone make a batch. I love dried dates, I eat them like candy. But, I haven't tried them in dessert form. But, why not try it out!? I searched around on the internet for a little bit to find a recipe to my liking. It didn't take long to find a recipe that I liked the look of! For never having a date bar before, I became an instant fan. Man, oh man, these are good! The crust is moist and buttery with the perfect hint of cinnamon. Then, a simple, unsweetened date purée (they are perfectly sweet without sugar) is slathered in between two layers of the crust. Perfection! They are a little messy to eat, but that hasn't stopped any of us from devouring them! My daughter has particularly enjoyed having them in her lunch this week! For the date filling; place the pitted dates and water in a medium saucepan and cook over low heat, stirring occasionally, until the dates are soft and have absorbed most of the water, about 10 minutes. Remove from heat and stir in the vanilla extract. Let cool to room temperature and then purée in a food processor until smooth. Transfer to a bowl and wipe out the food processor bowl. Preheat oven to 350˚ F and place rack in center of the oven. Grease an 8 or 9 inch square baking pan. Line the bottom of the pan with parchment paper. Set aside. For the oatmeal crust; In the bowl of the now clean food processor, place the oats, flour, sugar, baking soda, salt and ground cinnamon. Pulse to combine. Then add the butter and pulse until the mixture is crumbly and just begins to come together. Press about 2/3 of the mixture onto the bottom of the prepared pan. Spread the date purée evenly over the oatmeal crust. Sprinkle the remaining dough evenly over the top of the dates, press down gently to compress. Bake for about 30-40 minutes or until golden brown. Place on a wire rack to cool. Once the squares have cooled completely, cut into squares. Serve, or store in an air tight container in the refrigerator up to one week.